Just over a week ago we had one of our Bible Training Center alumni visit us at the church. Corina is originally from Germany and she now lives in South Africa where she works with children. 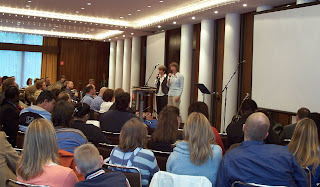 Here below I have posted a picture of Corina sharing about her work at our church. It was great to hear about the work that Corina is doing in South Africa. It was also very nice to listen to Corina and see how she has gone from a student in school to an alumnus who is out proclaiming the Good News to others. 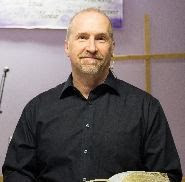 At the bottom of every newsletter I have my "Mission Statement" of "Teaching the Word of God and training believers for greater service in the Body of Christ." It is one thing for me to know and understand the Bible so that I can teach and help others. But my desire is to go beyond my own personal development and to teach others to apply the Word of God to their own life and then also reach others with the truth. When I see one of our graduates, or someone else I have worked with, sharing the life changing message of the Word of God it gives me great satisfaction. There are a lot of things that people use to measure their success. When I see someone I was able to help succeeding in life and the work that God has called them to, that is success to me!